The horizontal gaze nystagmus test or evaluation (commonly known as the HGN or HGN test) is one of the three NHTSA standardized field sobriety tests (SFST) offered to motorists (who are suspected of DUI-alcohol while operating a vehicle). 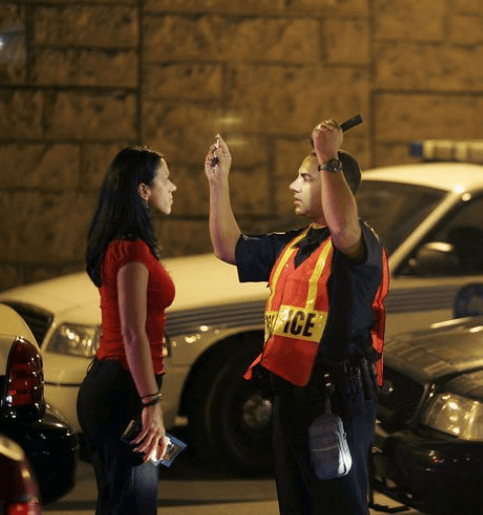 Typically, the law enforcement officer making the traffic stop is the one who administers the eye tests to the DUI suspect at the roadside, as part of a driving under the influence, DUI-DWI investigation. Once a driver is in contact with a police officer, after being detained for an alleged traffic ticket or at a DWI-DUI checkpoint, that suspected drunk driver will be asked to submit to roadside tests. EVERY police-requested field sobriety test is VOLUNTARY, and DUI specialists will tell you to NEVER take any optional tests. The HGN is a tracking test of eye movements of the suspected intoxicated driver, but is not a vision test. Law enforcement officers are told is the “most reliable” field sobriety test, and it is supposed to be the first test given. Since the field sobriety tests promulgated by the National Highway Traffic Safety Administration (NHTSA) will be one of the key items of evidence in an impaired driving (driving under the influence of alcohol) case, the task of DUI lawyers who are defending a criminal case is to eliminate or neutralize the roadside HGN evaluation. How Many NHTSA Standardized Field Sobriety Tests are There? One of three (3) standardized field sobriety tests sanctioned by NHTSA, the nystagmus test is a psychophysical exam that deals with involuntary jerking of the eye (which doctors call saccadic movement) as the test subject’s two eyes move together, side to side. The person being tested for HGN keeps his or her head still and tries “to use their eyes only” to follow the object (which police call “the stimulus’) as it is being passed from side to side (by the police officer). The officer then can see how your eyes “track” the moving object passing across your field of vision. Multiple “passes” are required, as the officer seeks to observe any “clues” or “cues” (obtained by the police officer’s separate observation of each eye). 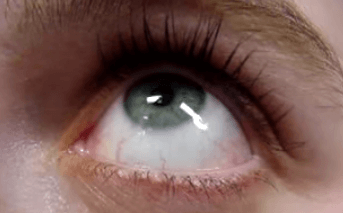 To properly score and perform horizontal gaze nystagmus on any person, the NHTSA-trained police officer is mandated to medically qualify the test subject. This medical qualification screening procedure, to find out if the person is a suitable “subject,” is accomplished through asking the citizen questions about eye problems and medications being taken, plus by checking the detained person’s eyes for resting nystagmus (congenital nystagmus, that exists at all times). Plus, before attempting any of the three standardized HGN tests, the investigating police officers must use a separate, preliminary, equal tracking screening test during which a stimulus is moved briskly across the test subject’s field of vision, to eliminate the possibility of head trauma or brain lesions. How Is the HGN Eye Nystagmus Test Performed? For all of the “horizontal gaze” tests, the position of the stimulus must be held slightly above eye level, or approximately at the bottom of the person’s eyebrows. Holding the stimulus too high can TRIGGER gaze nystagmus, even when little or no alcohol is present in the person’s system. This “false positive” problem was proven in NHTSA’s so-called “Robustness Study,” conducted in 2007. The three types of HGN eye test passes (made by investigating police officers) are called lack of smooth pursuit, distinct and sustained nystagmus at maximum deviation and onset of nystagmus as the stimulus is slowly moved out to 45 degrees from the center of the person’s face. Since each eye is separately “scored” and three different types of horizontal nystagmus are being checked, a maximum of six clues (or cues) can be obtained, for the field sobriety test scoring sheet. All police officers who attend the NHTSA-based field sobriety test training is taught by their Instructor that the horizontal gaze test is the most valuable and reliable of the three standardized field tests sanctioned by the National Highway Traffic Safety Administration. They are told that it accurately predicts who should be arrested for driving while intoxicated, based on 4 or more clues or cues being observed, and that these clues mean that the person is likely at 0.08 grams percent or higher. So, being scored at either 4 clues or 6 clues is an “arrest decision,” according to NHTSA SFST training. Police falsely testify that “observing 4 or more clues on HGN indicates IMPAIRMENT,” and this claim is a lie. Dr. Marcelline Burns, the person who CREATED the NHTSA field tests, has verified this fact at a legal seminar held in California. 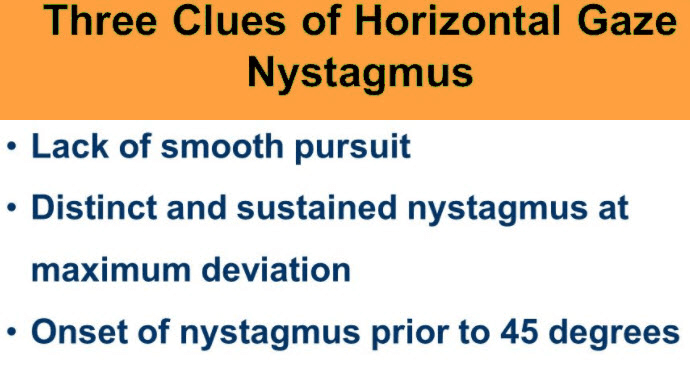 The horizontal nystagmus gaze test has a maximum of 6 clues and is followed by vertical gaze nystagmus, where the officer moved the stimulus up and down, which has NO clues. 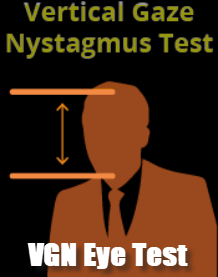 These vertical passes are administered to see if vertical gaze nystagmus (VGN) is present, in your eyes. The VGN eye test is not a scored test, by counting any “clues,” and only identifies a possible high dose of alcohol for that particular individual. But, this claimed statistical correlation of a VGN test has not been scientifically proven to do what police are trained to testify that it WILL do, and such testimony should be excluded by way of your DUI defense attorney filing and arguing a pre-trial motion in limine, in your DUI case. After the Nystagmus Tests, What Other Field Sobriety Tests Are Given? Police are trained to try to obtain all three of the standardized field sobriety test exercises. Two other roadside evaluations are typically requested by police officers, which are the “walk and turn” (WAT) evaluation and the “one leg stand” (OLS) evaluations. Neither of these is a psychophysical test (which HGN would be classified), but are called “divided attention” tests. In simple terms, the subject attempting the walk and turn is being scored for following specific NHTSA-mandated instructions when walking, while touching heel to toe, along a line for 9 steps out with arms against your side, and nine steps back, after making a specific-type of counterclockwise turn. Up to eight clues can be observed, and if 2 of the 8 clues are noticed, the person is then claimed to be over the legal alcohol limit. The last field sobriety test given is the 30-second “stand on one leg” one-leg-stand test. Like the walk and turn and the HGN tests, detailed, precise instructions from the police officer are required, for the exercise to be considered “valid.” This non-scientific field test evaluation is a timed test lasting 30 seconds can produce up to four total clues, and if 2 of the 4 are observed by the arresting officer, he or she will claim that your “failed” and that this means that you are likely to be over the alcohol legal limit. Over half of all people age 40 or more cannot perform this evaluation when totally sober, much less overweight individuals, and NHTSA does not exclude either category of test subjects from being evaluated and arrested. How many DUI lawyers are former police officers, who made DUI arrests? One of our DUI law firm Partners, Cory Yager, made over 1000 DUI arrests, as a law enforcement officer, over his police career, spanning nearly 10 years. He is both a practitioner and an Instructor in the SFSTs. After his years of employment as a police officer, DUI defense attorney Cory Yager became a DUI lawyer, defending people in drunk driving defense cases. 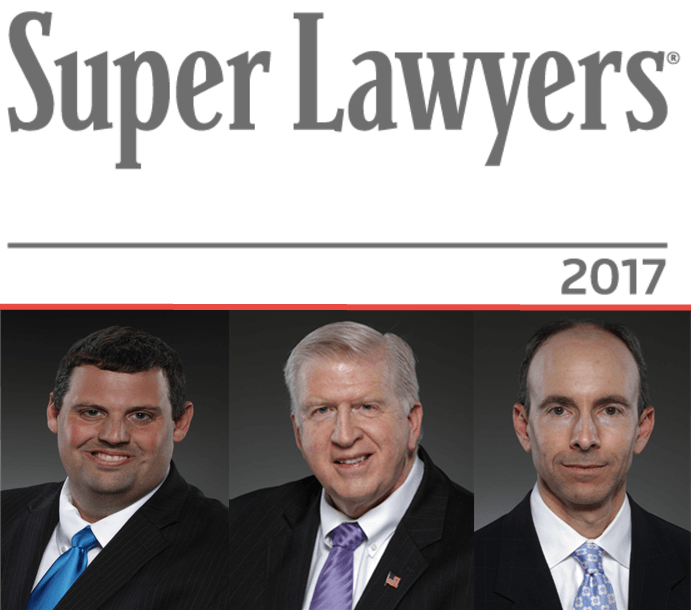 Plus, both DUI Specialist Larry Kohn and drunk driving book author William C. “Bubba” Head, have been SFST Instructors in the NHTSA 3-test battery of roadside tests since 1999. What other DUI law firm in GA can match those credentials? 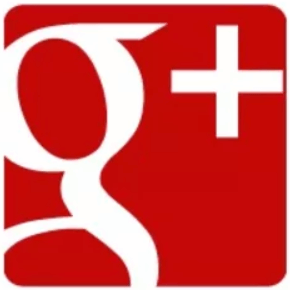 For a FREE legal consultation contact our DUI attorneys, and a Partner will assess your DUI case, the Georgia DUI court that your case will be adjudicated in, and how we would approach winning your drunken driving case. Call 404-567-5515, for FREE legal advice from our Field Sobriety instructor DUI defense lawyers.